Dreamworks Animation has an odd track record, to say the least. For every Shrek, there’s a Shark Tale. For every Kung Fu Panda, a Turbo. Suffice to say, Dreamworks seems to greenlight any idea that passes through their studio to see what works. Sometimes Dreamworks’ better movies find the success they deserve, and sometimes they don’t. 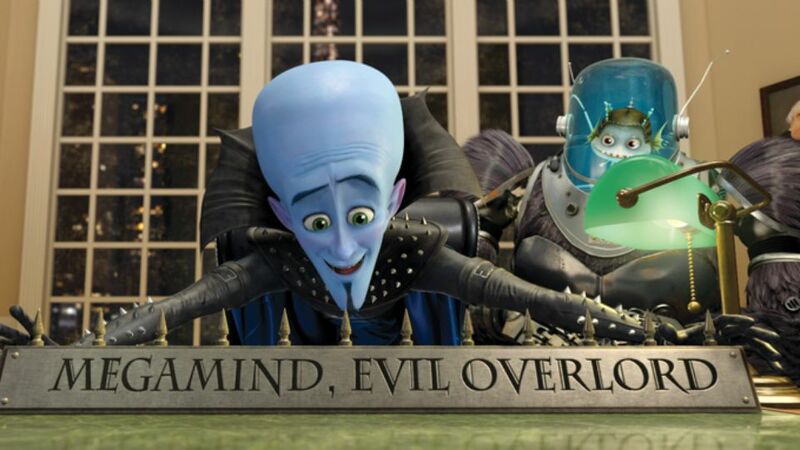 Sadly, Megamind falls into the latter category, as it was a fun and humorous reverse-super hero romp that seems largely forgotten, due in no small part to bad timing. Megamind had some good writing and a decent amount of originality at its disposal, but it was released in 2010, a pretty strong year for animated films that saw the likes of Toy Story 3 and Dreamworks’ own How to Train Your Dragon hit theaters. Perhaps most notably of all, 2010 was also the year that saw the release of Despicable Me, a film that shared a similar concept to Mega Mind. And seeing as Despicable Me will soon see the release of its third entry, and even had a spinoff film that grossed over a billion dollars worldwide, it’s safe to say which of these villain-turned-hero movies won the war. Perhaps another aspect that held Megamind back from reaching its potential success was its setup. While Despicable Me starred a cartoonish parody of a James Bond-style villain, Megamind focuses on a more comic book-styled super villain. Seeing as the superhero genre was oversaturated even back in 2010, the idea of a super hero parody didn’t exactly stand out (even the “proper” super hero films often find the time to parody themselves by this point). Suffice to say, Megamind came and went, and that’s a bit of a shame. Because while it may not be an animated classic by any means, Megamind does provide a good time, and manages to sprinkle in a surprising amount of character development along the way. The titular Megamind (Will Ferrell) is an alien from a far off planet. In a spoof on Superman’s origin story, Megamind was sent to Earth during his planet’s destruction, while a family on a neighboring planet (also in the destruction process) has the same idea. The two alien babies’ space pods collide on their way to Earth. While one baby lands into a loving, privileged family and grows up to become Metro Man (Brad Pitt), Metro City’s super powered savior, the other baby ends up being raised by inmates, and eventually becomes the evil genius Megamind. Over the years, Megamind and Metro Man have had countless battles, with the villain often kidnapping news reporter Roxanne Richie (Tina Fey) or threatening the city, and Metro Man always stopping him. One day, Megamind seems to accomplish the impossible, and seemingly kills Metro Man during one of his attempted rescues of Roxanne. With Metro Man out of the picture, Mega Mind takes control of the city, though he doesn’t really know what to do with it. Megamind was only ever thrown into the role of villain out of circumstance, and never knew what to do if he got what he thought he wanted. Without a hero to fight, Megamind loses his purpose in life, and begins to have an identity crises. During his downward spiral, Megamind, along with his aptly-named henchman, Minion (David Cross), concoct a plan to create a new hero for Metro City. Using some of Metro Man’s DNA, the duo plan to use Roxie’s cameraman Hal Stewart (Jonah Hill) as their subject. But the plan backfires when Hal turns out to be a selfish, irresponsible jerk, using his powers to become the new villain of the city, leaving Megamind with a huge dilemma on his shoulders. It’s a fun and simple setup. Placing the super villain in the central role of a super hero parody may not sound entirely original, but the film does a great job at delivering comedy out of its premise, as well as making Megamind a surprisingly sympathetic character. The film has a lot of fun playing up super hero tropes, while also having some good fun with Megamind’s alien ways (one of the film’s best running gags is Megamind’s constant mispronunciations). But it also does a great job at giving its titular blue villain a pretty heartfelt story arch. Though the other characters aren’t nearly as well fleshed-out, they still prove memorable in their own right (Hal is probably a more properly hatable villain than most of those found in the recent Marvel films). Megamind also boasts some great visuals, with the caricatured character designs holding up a bit better than the Dreamworks features that try a more realistic approach. Metro City is also impressively realized, boasting a scope and set pieces that rival those found in live-action super hero films. Admittedly, their aren’t a whole lot of major complaints to be had with the film. Primarily, it’s a bit on the predictable side, and as stated, even a parody of the super hero genre doesn’t change things from being another entry in such an exhausted genre, and the film lacks enough newness to elevate it beyond that. One character complaint to be had is with Metro Man himself. The film does a great job at making him a showman who enjoys his place in the spotlight and schmoozing the crowds. But – without spoiling any specifics – the film later robs him of the more heroic attributes he does have after certain story revelations. Under certain circumstances it might work, but the film fails to make a compelling reason for us to still care about the character, despite an attempt at explaining his actions. On the whole, Megamind is a very fun movie, and certainly better than its reputation suggests. It treads a lot of familiar ground, but its sharp writing and well-developed main character put it on the better end of the Dreamworks Animation scale. Agreed! It’s good harmless fun.